Learn how to stencil flowers on furniture. I hear so many people saying they hate stenciling. Big blobs of paint or smears ruin their project. 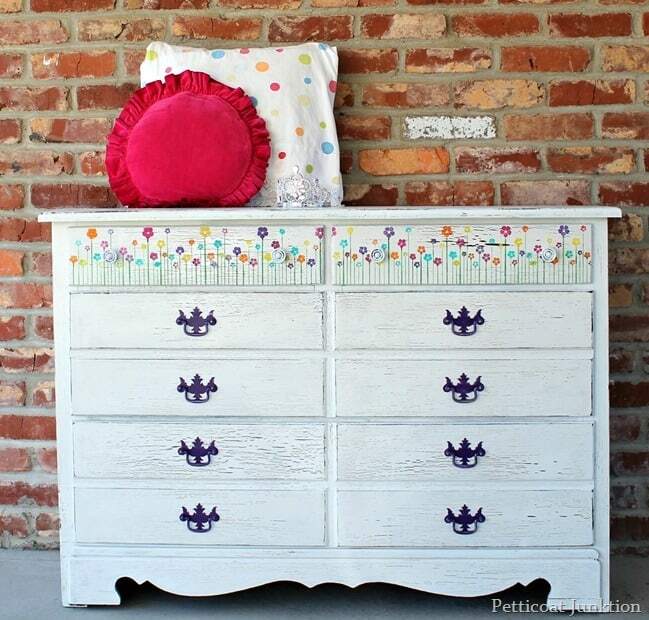 Well, when you learn the secret to stenciling you’ll be doing the happy dance. The little stenciled flowers sure turned out cute. I came home between my two college classes yesterday and painted and stenciled and painted and stenciled. Then we had the photo shoot after my last class of the day. I showed a little peek of the makeover in process yesterday and I know ya’ll thought it was going to be a boring white dresser. Me…boring….never! This project is featured on the Good Housekeeping website. I guess someone liked it! It was in very bad condition….gouges….burns…..bubbled varnish…..stuck on paper…..need I go on. It was bad. So I worked with the imperfections. It’s easier and much less time consuming to use a paint technique that accentuates the flaws than to try to repair the damaged areas. The paint is crackled in places and that just happened. I didn’t plan it. 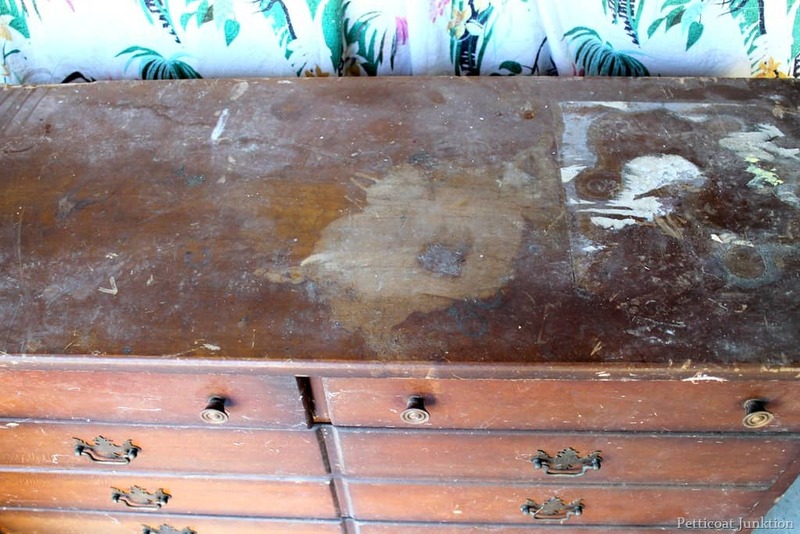 Sometimes the type of sealer or varnish used on the original finish will cause this affect. Do you like the flowers? I wanted a variety of colorful flowers and I selected colors that would compliment each other. The color of the hardware is….purple. It might be hard to tell the color from the photos. Sometimes different computers show colors differently. I first painted the original hardware white but then I had second thoughts. The Valspar spray paint was in my stash of paints ( $1 at Habitat Restore) and the color was perfect. Some of the flowers are painted purple so it works. The stencil is from Hobby Lobby. I bought it quite a while ago and pulled it out for this project. I first taped it into place. 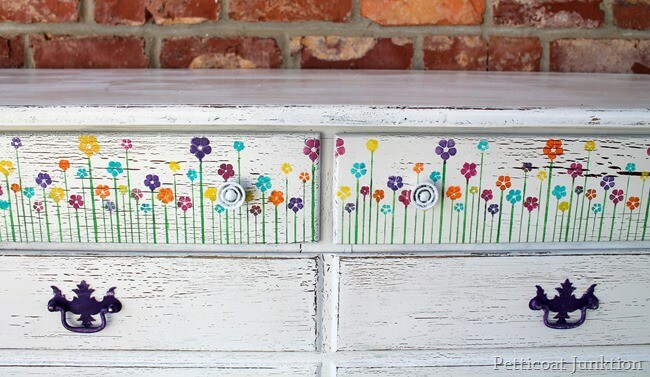 I only wanted to use the bottom row of flowers and the stems were too long for the drawer fronts so I adjusted the stencil down. You have to make things work sometime. Don’t be afraid to experiment. 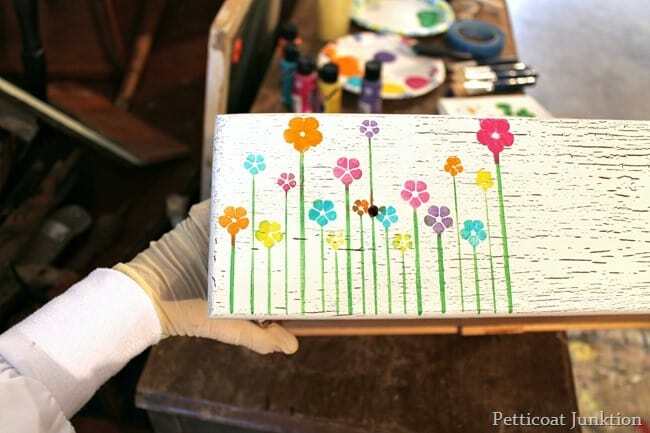 It’s only paint and you can wipe it off before it dries or paint over it! I used acrylic paints you know…. the kind of paint in the little bottles. I keep a variety of colors on hand. As you can see in the photo above I chose the colors I wanted to use then squeezed a small amount of each color onto a paper plate. 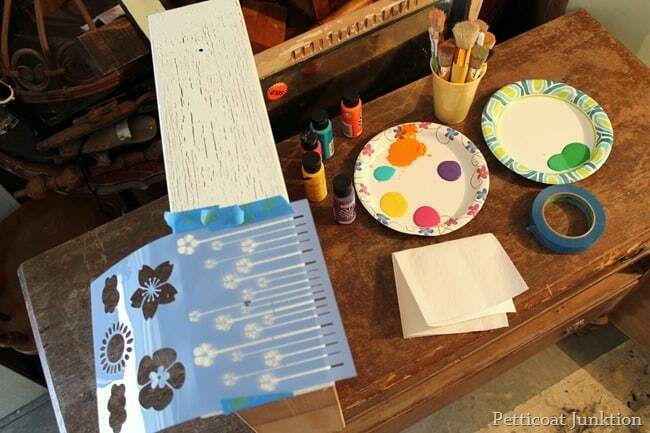 I don’t have a paint palette and paper plates or pieces of cardboard boxes work great and no washing up…just toss them. I have a supply of stencil brushes but I also used some small foam brushes. The small stencil brushes are the best.You will also notice I have a paper towel laying there to wipe extra paint off of the stencil brush. 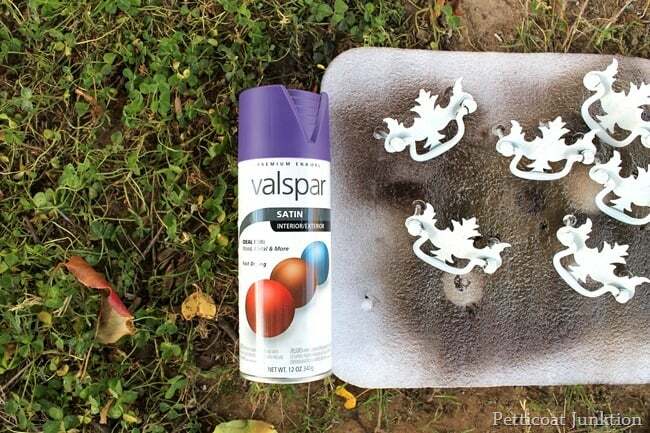 You want to stencil with a very dry brush. That is the secret. I have a much more in-depth tutorial at Stencil Tutorial-Layer Colors Like A Pro. This project was a little more difficult to work because the stencil was larger than the drawer and it didn’t lay flat very well, even taped down. I had to hold the stencil in place close to where I was applying the paint. The first bunch. 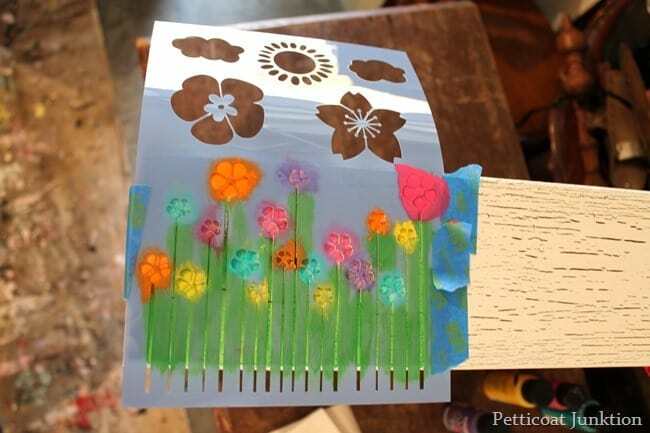 See how they are definitely not perfect….but they are pretty! Perfect is over-rated. My motto is “perfectly imperfect”. I choose to only stencil the flowers on the top two drawers. 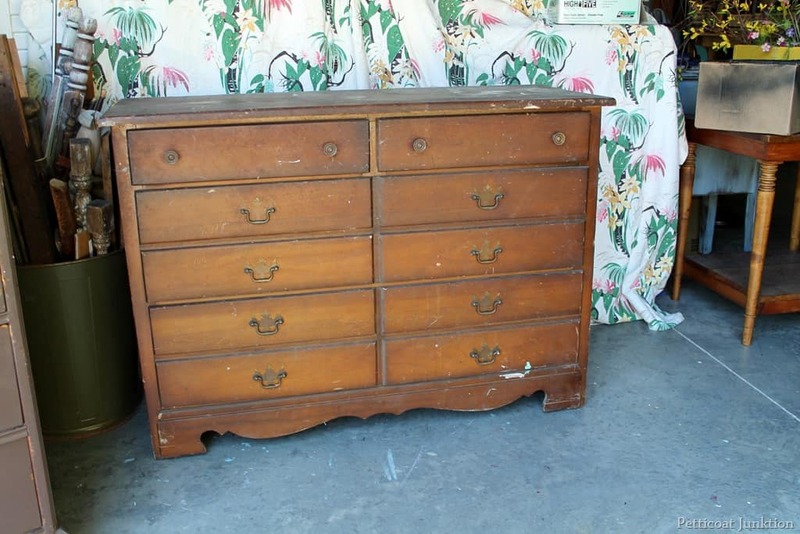 And the knobs on those two drawers are small and white. Stenciling all of the drawers would have been overkill. I love how it naturally crackled in places, it really looks awesome! 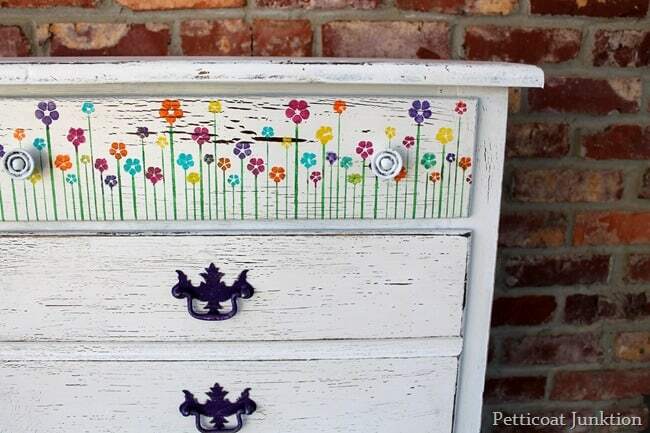 What a cute idea to add the flowers on the top drawers, some little girl will love this dresser. And the pulls…almost look like a dark bluey/purple? I saw this on your link with Miss Mustard Seed but didn’t know how to “like” it on her page. Beautiful job and I love the stencil just at the top! What a fun dresser for a young girl’s room! I really love what you did here. The before and after photos are incredible! The flowers look like their at the end of a pond or lake. Looks like ripples in the water. Love it and thought the hardware was black until reading the posts. Sorry “they’re”. You could add a sail boat or something else nautical on the drawers with the ripples. Love this item. This is adorable!!!! I am gonna pin this one to our board! Thanks for sharing on DIY Sunday Showcase!! Purple hardware… My very favorite color for everything! My guess was purple too! Great inspiration for a poor castoff dresser! It certainly is happy now. 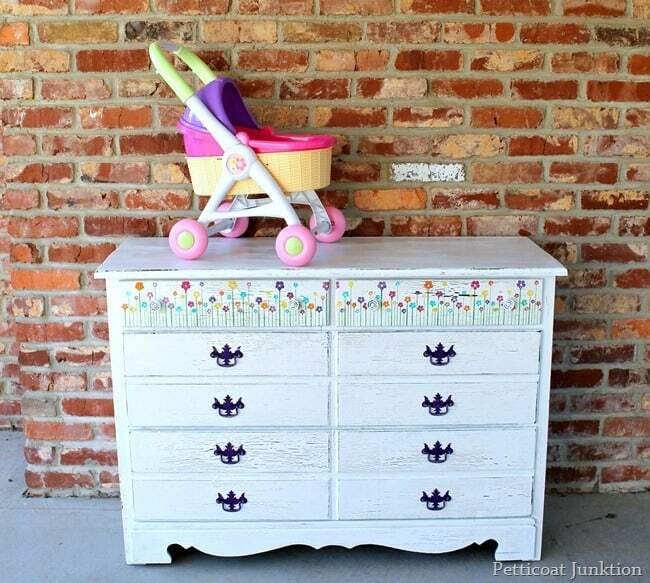 Very nice for a little girl’s room! The hardware is PURPLE!